Prosperity in the Fourteenth Century. Under French and Austrian Rule. The University and the Jews. City of upper Italy, 22 miles west of Venice, on the Bacchiglione; capital of the province of the same name. Its Jewish congregation, for centuries one of the most important of Italy, with the synagogue and cemetery, existed as early as 1300. The first Jew in Padua known by name was the physician Jacob Bonacosa, who, in 1255, translated there the "Colliget" of Averroes (Steinschneider, "Hebr. Uebersetzungen," p. 671). Toward the middle of the fourteenth century numbers of Jews from Rome, Pisa, Bologna, and the Marches of Ancona established themselves in Padua as money-lenders; and many of the Jews who had been persecuted in Germany and the Alpine countries removed to Padua after 1440. 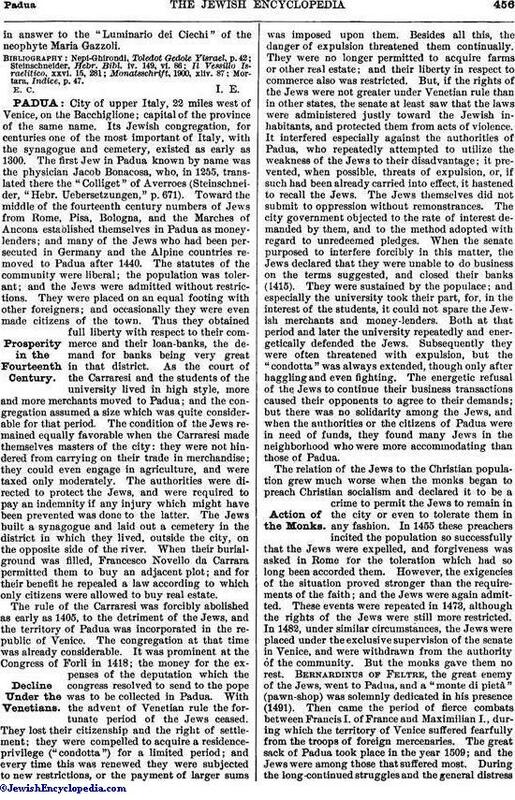 The statutes of the community were liberal; the population was tolerant; and the Jews were admitted without restrictions. They were placed on an equal footing with other foreigners; and occasionally they were even made citizens of the town. Thus they obtained full liberty with respect to their commerce and their loan-banks, the demand for banks being very great in that district. As the court of the Carraresi and the students of the university lived in high style, more and more merchants moved to Padua; and the congregation assumed a size which was quite considerable for that period. The condition of the Jews remained equally favorable when the Carraresi made themselves masters of the city: they were not hindered from carrying on their trade in merchandise; they could even engage in agriculture, and were taxed only moderately. The authorities were directed to protect the Jews, and were required to pay an indemnity if any injury which might have been prevented was done to the latter. The Jews built a synagogue and laid out a cemetery in the district in which they lived, outside the city, on the opposite side of the river. When their burial-ground was filled, Francesco Novello da Carrara permitted them to buy an adjacent plot; and for their benefit he repealed a law according to which only citizens were allowed to buy real estate. The rule of the Carraresi was forcibly abolished as early as 1405, to the detriment of the Jews, and the territory of Padua was incorporated in the republic of Venice. The congregation at that time was already considerable. It was prominent at the Congress of Forli in 1418; the money for the expenses of the deputation which the congress resolved to send to the pope was to be collected in Padua. With the advent of Venetian rule the fortunate period of the Jews ceased. They lost their citizenship and the right of settlement; they were compelled to acquire a residence-privilege ("condotta") for a limited period; and every time this was renewed they were subjected to new restrictions, or the payment of larger sums was imposed upon them. Besides all this, the danger of expulsion threatened them continually. They were no longer permitted to acquire farms or other real estate; and their liberty in respect to commerce also was restricted. But, if the rights of the Jews were not greater under Venetian rule than in other states, the senate at least saw that the laws were administered justly toward the Jewish inhabitants, and protected them from acts of violence. It interfered especially against the authorities of Padua, who repeatedly attempted to utilize the weakness of the Jews to their disadvantage; it prevented, when possible, threats of expulsion, or, if such had been already carried into effect, it hastened to recall the Jews. The Jews themselves did not submit to oppression without remonstrances. The city government objected to the rate of interest demanded by them, and to the method adopted with regard to unredeemed pledges. When the senate purposed to interfere forcibly in this matter, the Jews declared that they were unable to do business on the terms suggested, and closed their banks (1415). They were sustained by the populace; and especially the university took their part, for, in the interest of the students, it could not spare the Jewish merchants and money-lenders. Both at that period and later the university repeatedly and energetically defended the Jews. Subsequently they were often threatened with expulsion, but the "condotta" was always extended, though only after haggling and even fighting. 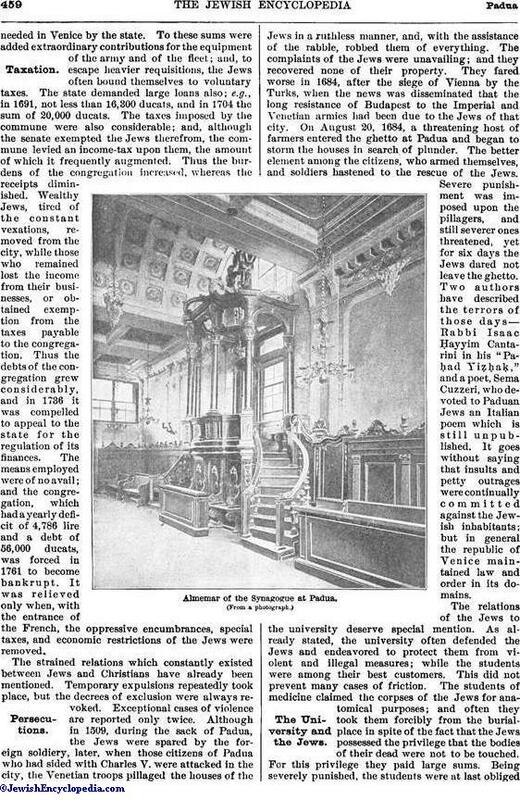 The energetic refusal of the Jews to continue their business transactions caused their opponents to agree to their demands; but there was no solidarity among the Jews, and when the authorities or the citizens of Padua were in need of funds, they found many Jews in the neighborhood who were more accommodating than those of Padua. The relation of the Jews to the Christian population grew much worse when the monks began to preach Christian socialism and declared it to be a crime to permit the Jews to remain in the city or even to tolerate them in any fashion. In 1455 these preachers incited the population so successfully that the Jews were expelled, and forgiveness was asked in Rome for the toleration which had so long been accorded them. However, the exigencies of the situation proved stronger than the requirements of the faith; and the Jews were again admitted. These events were repeated in 1473, although the rights of the Jews were still more restricted. In 1482, under similar circumstances, the Jews were placed under the exclusive supervision of the senate in Venice, and were withdrawn from the authority of the community. But the monks gave them no rest. Bernardinus of Feltre, the great enemy of the Jews, went to Padua, and a "monte di pietà" (pawn-shop) was solemnly dedicated in his presence (1491). Then came the period of fierce combats between Francis I. of France and Maximilian I., during which the territory of Venice suffered fearfully from the troops of foreign mercenaries. The great sack of Padua took place in the year 1509; and the Jews were among those that suffered most. During the long continued struggles and the general distressthere was no time to take heed of them; but in 1547 another storm was raised against the Jewish bankers, and the republic ordered their banks to be closed. Had not the university, and especially the juridical faculty, energetically guarded the interests of the Jews, the latter probably could not have remained in Padua. As it was they were able to maintain themselves in the city, although they were forbidden to carry on money transactions. Now the authorities desired to separate them from the Christians. From 1541 the establishment of a ghetto was demanded; but the senate did not agree until 1581, and, owing to numerous obstacles and difficulties on the part of the Jews, the institution did not come into existence until 1602. There the Jews lived, always amid the same struggles and in the same state of uncertainty, until 1797. On April 28 of that year the French military entered Padua, and the hour of liberty for the Jews came. On Aug. 28 following they were accorded the unrestricted right to live in any part of the city; and the ghetto was called "Via Libera." The French were displaced in 1798 by the Austrians, who, animated by the spirit of Joseph II., accorded far-reaching privileges to the Jews—some families were even ennobled—so that their régime was generally hailed with joy. From 1805 to 1814 Padua was included in the kingdom of Italy by Napoleon; and thus the Jews, as subjects of the French empire, had the opportunity of participating in the Sanhedrin at Paris; Rabbi Isaac Michael Finzi acted as vice-president of that body. After the treaty of Vienna, Padua again belonged to Austria, except during brief intervals; and the Jews enjoyed all the privileges with the exception of eligibility to public offices. Full emancipation was not accorded to them until 1866, when Padua was incorporated into the present kingdom of Italy. The Jews of Padua occupied themselves originally with money transactions, and thereby fulfilled an economic mission which was highly beneficial to the district. The demand for money both by the authorities and by private individuals was urgent, loans at burdensome rates of interest being obtained from numerous citizens and Tuscans. The Jews did not impose heavier terms than the latter; and the high rate of interest, 20 to 30 per cent, was not considered exorbitant during those uncertain times. The transaction of monetary affairs by the Jews was furthered under the Carraresi; and they established several trading societies which pursued the business of banking. The great demand for money is evidenced by the fact that in 1432, with 17,000 inhabitants, the town possessed seven loan-banks. The customers of the Jews included, besides private individuals, the community, which was compelled to borrow money in cases of extraordinary expenses, and the bishop, who pledged his receipts to obtain funds. But the university, above all, urgently required the presence of the Jews in the capacities of foreign lecturers and students. Economic conditions changed about the middle of the fifteenth century, and the intention was to restrict the Jews to a lower rate of interest; but they protested that they could not continue to do business if the rate was reduced, and so kept the upper hand. The establishment of the above-mentioned "monte di pietà" advanced their business rather than injured it, as now they were able to obtain money at moderate interest. The number of banks increased enormously, and all of them prospered. But, as mentioned previously, in 1547 the Jews were compelled to close the banks, and money transactions were prohibited. Two years previously the authorities of the city had forced the Jews to adopt the Italian language in their business documents, for which, until then, in spite of numerous protests, they had employed Hebrew. The majority of the Jews of Padua were not, however, engaged in money transactions, but dealt in merchandise. They attempted to be active in all spheres; but everywhere they encountered Christian competition. Nevertheless, they maintained their ground, except in cases in which the law prevented them from doing business. The Jewish merchants kept a well-assorted stock of goods, and sold their goods at a moderate profit. But the more their business flourished and increased—in 1615 they owned eighty-four of the 886 stores in the city—the more actively did the community petition the senate of Venice to prohibit them from engaging in mercantile pursuits. Again the representatives of the university emphasized the economic advantage derived from the presence of the Jews, and defended the rights of the latter. The Jews were obliged to struggle also against the merchant gilds. Ever since the fourteenth century they had dealt in gold, silver, and precious stones; they did exceedingly well in the import of foreign goods; and they worked also as goldsmiths. But the gild of gold-workers harassed them wherever it could. The Jews had been allowed to purchase the pledges of the "monte di pietà" when they were sold at auction; but as the Christians did not wish Jewish competition, Jews were forbidden to participate further in these sales. The university demanded that the Jews should at least be allowed to buy the books of the students, so that the latter might be able to purchase them back at moderate prices; but in this it was not successful. The retailing of goods and peddling were the only occupations not denied them; and they were even admitted into the pedlers' gild, or, rather, a "fraglia degli strazzaroli Giudei" was formed beside the Christian one (1448). Upon the payment of 125 lire per year, the Jews were permitted to participate in all the rights of the gild. An agreement was also made, in 1539, with the gild of the shoemakers, that the Jews should be permitted to trade in leather; but when they proposed to enlarge their business they were strictly forbidden to do so. The gild of manufacturers also opposed the Jews. The latter did an extensive business in cloth, linen, and similar goods; but in 1558, in consequence of the opposition, they were ordered to be excluded from this trade. A protest from the universitycaused a suspension of the decree; but the interdict was repeated in 1571. 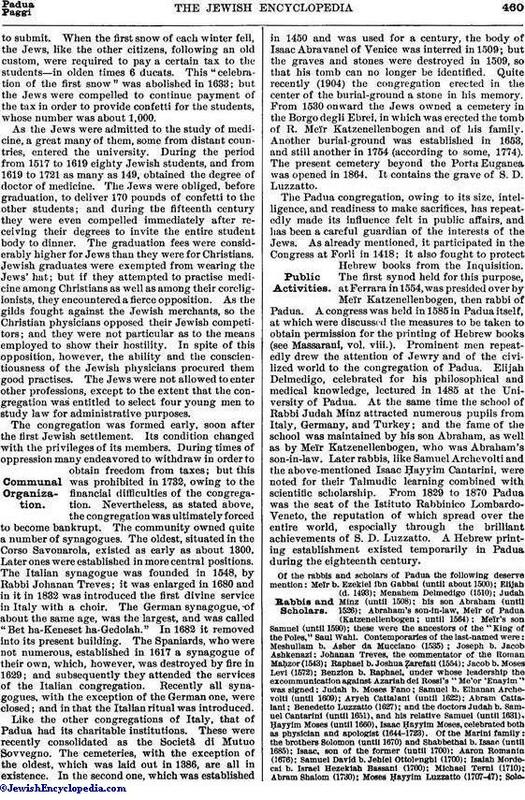 Again the university interceded for the Jews; and it was now supported by the community, which acknowledged the advantages of Jewish commercial activity. A fierce conflict ensued between these authorities and the gild; and at length the Jews were accorded the privilege of dealing in manufactured goods (1581). Owing to the luxury common in Padua, they prospered. The Christian merchants did not, however, cease their struggle against the annoying competition. In 1623 they determined that only members of the gild should be allowed to sell manufactured goods; and the Jews, accordingly, were compelled to suspend operations. Later, however, they were permitted to resume. Moses Mantica had attempted, as early as the fifteenth century, to establish silk-factories in Padua; but he had not been successful. In 1645 a Jew named Trieste established a factory for silk goods; and 6,000 persons in the vicinity found work at the looms. The Christian merchants, unable to compete with him, endeavored to obtain a decree forbidding the Jews to manufacture. The brothers Cantarini wished to establish a silk-spinning mill in 1713; but they were prohibited from erecting a building. The conflict continued for a long time, the Jews meanwhile pursuing their operations, to the great benefit of the population; but in 1779, in consequence of continued calumnies, they were absolutely forbidden to manufacture. Nor were they allowed to devote themselves to any trade, even that of tailoring. The Jews were originally unrestricted with regard to their dwellings. At first they settled across the river, in remote parts of the town (near the present railroad station); but with increasing numbers, they removed into the central parts of the town, the street Volto dei Negri, in which many of them lived, being called "Volto degli Ebrei." They continued to spread as far as the vicinity of the cathedral. The ghetto established in 1602 comprised those streets which had already been principally inhabited by Jews. It was enclosed by four gates, on which were insulting inscriptions; these were published by Wagenseil ("Sota," pp. 476 et seq., Altdorf, 1674). The Jews were compelled to submit to the new regulations as to residence; but they soon complained of the miserable and unhealthful dwellings, for which they were obliged to pay excessively high rents. The streets were narrow and dark; the houses, damp; and, besides, the habitations were so overcrowded that during epidemics the ghetto was a fearful focus of infection. The congregation lost an enormous number by death during epidemics; for instance, during the plague of 1631. The ghetto existed until 1797, when the French destroyed the gates. They were never reerected. Other ecclesiastical measures against the Jews were enforced; e.g., those concerning the Jews' oath and, from 1430, the badge. Frequent exceptions were, however, allowed, as in the case of the interdicts against going abroad during Passion week and keeping Christian servants. The senate at Venice would not accede to further encroachments by the Church. When, after the death of Simon of Trent in 1475, Jew-baiting prevailed, the senate prohibited the sermons; and in 1570 it forbade the compulsory attendance of Jews at Christian discourses. The senate in 1587 declined to allow them to be placed under ecclesiastical jurisdiction. On the other hand, it permitted in 1556 the burning of the Talmud and other Hebrew books. The state prohibited compulsory baptism also; but converted Jews were richly rewarded, and their baptism was celebrated amid great rejoicing of the most distinguished circles. The greatest sensation was caused in 1602 by the baptism of a rabbi (? ), Solomon Cattelan, whose conversion was regarded as a merciful miracle, and was described in a special book. Court of a Sixteenth-Century Synagogue at Padua, Showing Cistern and Font. Taxes were paid for all its members by the congregation, which assessed the individuals. The levies were moderate under the Carraresi; but they gradually rose until they became an important source of income. The Jews were compelled to pay 850 ducats yearly for their loan-banks and 200 (from 1585 onward, 300) ducats for the right of residence. The latter tax went to the community. The taxes and the fees for the right of residence together amounted to 900 ducats in 1700. Besides, the congregation was compelled, from 1591, to contribute 700 ducats annually for the support of the banksneeded in Venice by the state. To these sums were added extraordinary contributions for the equipment of the army and of the fleet; and, to escape heavier requisitions, the Jews often bound themselves to voluntary taxes. The state demanded large loans also; e.g., in 1691, not less than 16,300 ducats, and in 1704 the sum of 20,000 ducats. The taxes imposed by the commune were also considerable; and, although the senate exempted the Jews therefrom, the commune levied an income-tax upon them, the amount of which it frequently augmented. Thus the burdens of the congregation increased, whereas the receipts diminished. Wealthy Jews, tired of the constant vexations, removed from the city, while those who remained lost the income from their businesses, or obtained exemption from the taxes payable to the congregation. Thus the debts of the congregation grew considerably, and in 1736 it was compelled to appeal to the state for the regulation of its finances. The means employed were of no avail; and the congregation, which had a yearly deficit of 4,786 lire and a debt of 56,000 ducats, was forced in 1761 to become bankrupt. It was relieved only when, with the entrance of the French, the oppressive encumbrances, special taxes, and economic restrictions of the Jews were removed. The strained relations which constantly existed between Jews and Christians have already been mentioned. Temporary expulsions repeatedly took place, but the decrees of exclusion were always revoked. Exceptional cases of violence are reported only twice. Although in 1509, during the sack of Padua, the Jews were spared by the foreign soldiery, later, when those citizens of Padua who had sided with Charles V. were attacked in the city, the Venetian troops pillaged the houses of the Jews in a ruthless manner, and, with the assistance of the rabble, robbed them of everything. The complaints of the Jews were unavailing; and they recovered none of their property. They fared worse in 1684, after the siege of Vienna by the Turks, when the news was disseminated that the long resistance of Budapest to the Imperial and Venetian armies had been due to the Jews of that city. On August 20, 1684, a threatening host of farmers entered the ghetto at Padua and began to storm the houses in search of plunder. The better element among the citizens, who armed themselves, and soldiers hastened to the rescue of the Jews. Severe punishment was imposed upon the pillagers, and still severer ones threatened, yet for six days the Jews dared not leave the ghetto. Two authors have described the terrors of those days—Rabbi Isaac Ḥayyim Cantarini in his "Paḥad Yiẓḥaḳ," and a poet, Sema Cuzzeri, who devoted to Paduan Jews an Italian poem which is still unpublished. It goes without saying that insults and petty outrages were continually committed against the Jewish inhabitants; but in general the republic of Venice maintained law and order in its domains. 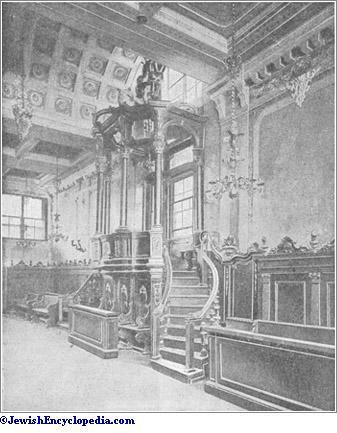 Almemar of the Synagogue at Padua. (From a photograph. )The University and the Jews. The relations of the Jews to the university deserve special mention. As already stated, the university often defended the Jews and endeavored to protect them from violent and illegal measures; while the students were among their best customers. This did not prevent many cases of friction. The students of medicine claimed the corpses of the Jews for anatomical purposes; and often they took them forcibly from the burial-place in spite of the fact that the Jews possessed the privilege that the bodies of their dead were not to be touched. For this privilege they paid large sums. Being severely punished, the students were at last obligedto submit. When the first snow of each winter fell, the Jews, like the other citizens, following an old custom, were required to pay a certain tax to the students—in olden times 6 ducats. This "celebration of the first snow" was abolished in 1633; but the Jews were compelled to continue payment of the tax in order to provide confetti for the students, whose number was about 1,000. As the Jews were admitted to the study of medicine, a great many of them, some from distant countries, entered the university. During the period from 1517 to 1619 eighty Jewish students, and from 1619 to 1721 as many as 149, obtained the degree of doctor of medicine. The Jews were obliged, before graduation, to deliver 170 pounds of confetti to the other students; and during the fifteenth century they were even compelled immediately after receiving their degrees to invite the entire student body to dinner. The graduation fees were considerably higher for Jews than they were for Christians. Jewish graduates were exempted from wearing the Jews' hat; but if they attempted to practise medicine among Christians as well as among their coreligionists, they encountered a fierce opposition. As the gilds fought against the Jewish merchants, so the Christian physicians opposed their Jewish competitors; and they were not particular as to the means employed to show their hostility. In spite of this opposition, however, the ability and the conscientiousness of the Jewish physicians procured them good practises. The Jews were not allowed to enter other professions, except to the extent that the congregation was entitled to select four young men to study law for administrative purposes. The congregation was formed early, soon after the first Jewish settlement. Its condition changed with the privileges of its members. During times of oppression many endeavored to withdraw in order to obtain freedom from taxes; but this was prohibited in 1732, owing to the financial difficulties of the congregation. Nevertheless, as stated above, the congregation was ultimately forced to become bankrupt. The community owned quite a number of synagogues. The oldest, situated in the Corso Savonarola, existed as early as about 1300. Later ones were established in more central positions. The Italian synagogue was founded in 1548, by Rabbi Johanan Treves; it was enlarged in 1680 and in it in 1832 was introduced the first divine service in Italy with a choir. The German synagogue, of about the same age, was the largest, and was called "Bet ha-Keneset ha-Gedolah." In 1682 it removed into its present building. 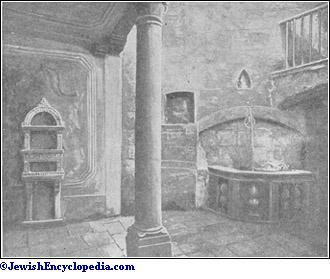 The Spaniards, who were not numerous, established in 1617 a synagogue of their own, which, however, was destroyed by fire in 1629; and subsequently they attended the services of the Italian congregation. 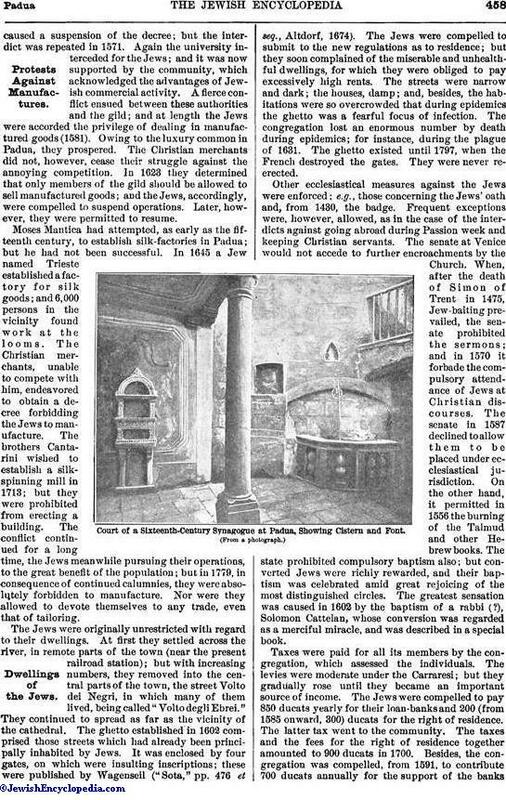 Recently all synagogues, with the exception of the German one, were closed; and in that the Italian ritual was introduced. Like the other congregations of Italy, that of Padua had its charitable institutions. These were recently consolidated as the Società di Mutuo Sovvegno. The cemeteries, with the exception of the oldest, which was laid out in 1386, are all in existence. In the second one, which was established in 1450 and was used for a century, the body of Isaac Abravanel of Venice was interred in 1509; but the graves and stones were destroyed in 1509, so that his tomb can no longer be identified. Quite recently (1904) the congregation erected in the center of the burial-ground a stone in his memory. From 1530 onward the Jews owned a cemetery in the Borgo degli Ebrei, in which was erected the tomb of R. Meïr Katzenellenbogen and of his family. Another burial-ground was established in 1653, and still another in 1754 (according to some, 1774). The present cemetery beyond the Porta Euganea was opened in 1864. It contains the grave of S. D. Luzzatto. The Padua congregation, owing to its size, intelligence, and readiness to make sacrifices, has repeatedly made its influence felt in public affairs, and has been a careful guardian of the interests of the Jews. As already mentioned, it participated in the Congress at Forli in 1418; it also fought to protect Hebrew books from the Inquisition. The first synod held for this purpose, at Ferrara in 1554, was presided over by Meïr Katzenellenbogen, then rabbi of Padua. A congress was held in 1585 in Padua itself, at which were discussed the measures to be taken to obtain permission for the printing of Hebrew books (see Massarani, vol. viii.). Prominent men repeatedly drew the attention of Jewry and of the civilized world to the congregation of Padua. Elijah Delmedigo, celebrated for his philosophical and medical knowledge, lectured in 1485 at the University of Padua. At the same time the school of Rabbi Judah Minz attracted numerous pupils from Italy, Germany, and Turkey; and the fame of the school was maintained by his son Abraham, as well as by Meïr Katzenellenbogen, who was Abraham's son-in-law. Later rabbis, like Samuel Archevolti and the above-mentioned Isaac Ḥayyim Cantarini, were noted for their Talmudic learning combined with scientific scholarship. From 1829 to 1870 Padua was the seat of the Istituto Rabbinico Lombardo-Veneto, the reputation of which spread over the entire world, especially through the brilliant achievements of S. D. Luzzatto. A Hebrew printing establishment existed temporarily in Padua during the eighteenth century. and the doctors Judah b. Samuel Cantarini (until 1651), and his relative Samuel (until 1631), Ḥayyim Moses (until 1660), Isaac Ḥayyim Moses, celebrated both as physician and apologist (1644-1723). his son Ephraim Raphael (until 1857). 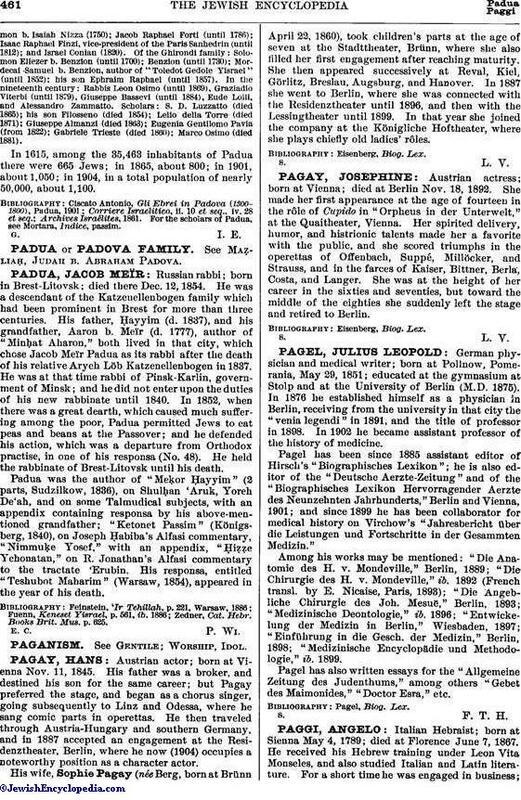 In 1615, among the 35,463 inhabitants of Padua there were 665 Jews; in 1865, about 800; in 1901, about 1,050; in 1904, in a total population of nearly 50,000, about 1,100. For the scholars of Padua, see Mortara, Indice, passim.